On October 31st at 11:59pm NST (only 60 seconds! ), refreshing anywhere on the Neopets site will get you the elusive Halloween site theme. This is the only time of year you can obtain it, so don't forget to stay up! Don't forget, you have until the end of October 31st to activate your Creepy Candles for the Haunted Mansion Neocash prizes. Don't forget to go trick-or-treating around Neopia. You'll have the opportunity to pick up some free goodie bags beginning October 31st at 12:01 AM NST until 11:59pm NST. 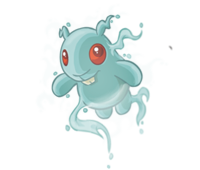 To celebrate, Count Von Roo is awake all day long on October 31st and allowing Neopets to play Deadly Dice with him. If you'd like to gamble for a few levels, go for a visit! The person dressed as Zero is a full win! ^Whoever it is must be the most amazing, creative genius in the history of Jellyneo! Happy Halloween, and congrats to all the winners Also thank you so much for the new cabinet themes! Great artwork, whoever draws them...they look amazing. Congrats to the Dreamworks logo! That outfit was amazing. Robbie Rotten will always be number one in our hearts. Congrats to all the winners of the Costume Contest! You all did an amazing job! I LOVE the artwork of the three Sanderson sisters! Those were by far my favorite costumes! Sweep as Daenery - Game of Thrones? Ummy as Sprinkle Donuts Bear? Congrats to the winners of the Costume Contest (loved the Dreamworks Logo! ), and a shocked thank you for the staff pick nod for my Ramaj! Happy Halloween, folks. What a great year for costumes! It was so hard to pick this year, I had like 5-6 top choices! Can't believe I made staff pick for once, considering the field Happy Halloween everyone! @tomatereloco Perry's the Kamala Khan version of Ms. Marvel... I'm not sure about Will. It's a very casual design. I think Ummy is supposed to be Tokidoki's Donutella. I uh..may have a problem with their blind boxes. I want to say Leaf is Ginko from Mushi-shi but I think that's wrong...I can't think of anyone else right now though? Oh darn, tomatereloco beat me to it. Well he pretty much got most of the ones I would have gotten, and a few I wouldn't. Leaf is Therion (the thief) from Octopath Traveler. And congrats to the winners of the Costume Contest! All of them were great and showed a lot of imagination. Nice, I really liked the top three winners' costumes this year! Genius to all! Excellent imagination from everybody! Well done to everyone in the Costume Contest as well! It was an amazing array of cleverness! I knew the Robbie Rotten one would win a top 3 trophy! The DW logo was awesome, too! @tomatereloco I'm Simon from SvtHSA/"Love, Simon"
@Will - Huh. I would've guessed Steve from Stranger Things. I got the site theme after all these years!! Even if i do have work early this morning, it's worth it! Another amazing year of costumes! I like the food costumes, especially chesu carrot. Are you a carrot person or just like carrot costumes? Also love Rosie's work as always. ^It looks like a carrot with a bite taken out of it! There are 38 comments above. Why not post yours?